The windmill was built by George Green’s father and although destroyed by fire in 1947, it has been fully restored. It’s one of only a few city centre windmills in England and it’s a great family attraction to visit. Much money has been spent on the mill over the years to keep the sails turning and it’s not unusual to find bits of restoration work taking place on the site. 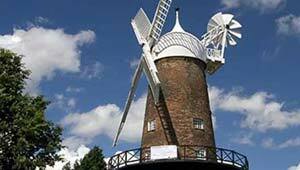 Green’s Windmill is in Sneinton which is just about in walking distance from Nottingham city centre. To walk, head up Pelham Street near Nottingham Council House. This turns into Carlton Street as you reach the tram lines. Keep going down the hill into Goose Gate and then across the A60 and round the back of the National Ice Centre. Walk a short way down Lower Parliament Street and take a left into Southwell Road, then turn right down Sneinton Road and follow this until Windmill Lane. At this point you can walk up Windmill Lane or walk through the small GreenPark to get to the Windmill. We did this with two kids in tow and it took around 20 minutes from the city centre. Green’s Windmill is free and it opens Thursday and Friday 11am to 3pm and Saturday and Sunday 11am till 4pm. On non-opening days, you can still visit the exterior of the windmill which can be viewed from the park along side it.